Cite this podcast as: Baimel, M, Etchells, E, Helman, A. 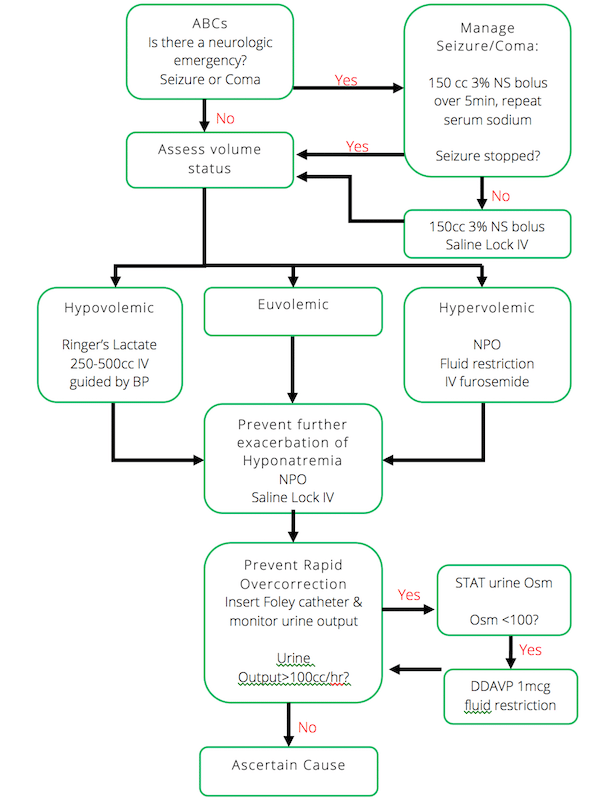 Emergency Management of Hyponatremia. Emergency Medicine Cases. March, 2015. https://emergencymedicinecases.com/episode-60-emergency-management-hyponatremia/. Accessed [date]. Hyponatremia is the most common fluid and electrolyte disorder encountered in clinical practice and is found in approximately 20% of admissions to hospital. In addition to being extremely prevalent, hyponatremia is an independent predictor of mortality. The lower the sodium and the faster the fall, the more symptomatic a patient will become. Symptoms are often vague and non-specific presenting as headache, irritability, lethargy, confusion, agitation or unstable gait leading to a fall. If the patient does not improve clinically after the first bolus, repeat a second bolus of hypertonic saline. What if hypertonic saline is not readily available? Administer one ampule of Sodium Bicarbonate IV over 5min. In order to defend the intravascular volume a determination an assessment of the patient’s volume status must occur. Is the patient hypovolemic, euvolemic or hypervolemic? Although volume status is difficult to assess with any accuracy at the bedside, a clinical assessment with attention to the patient’s history, heart rate, blood pressure, JVP, the presence of pedal and sacral edema, the presence of a postural drop (helpful in Dr. Etchell’s opinion) and point-of-care ultrasound (POCUS) is usually adequate to make a rough determination of whether the patient is significantly hypovolemic (requiring fluid resuscitation) or significantly hypervolemic (requiring fluid restriction +/- diuretics). In a patient who is hypovolemic and hyponatremic, the priority is to restore adequate circulating volume. In particular, restoring adequate circulating volume takes priority over any concerns that the hyponatremia might be corrected too rapidly and lead to osmotic demyelination syndrome. When selecting the type of fluid for restortation of adequate circulating volume in the hypovolemic/hyponatrmemic patient, be mindful of the sodium concentration of the fluid that you have chosen. Ringer’s lactate has a sodium concentration of 128mmol/L which will be more isotonic to the hyponatremic patient. Although never shown in clinical studies, administering Ringer’s lactate will likely result is a slower rise in serum serum sodium than Normal Saline, and therefore have a lower risk of potentiating osmotic demyelination syndrome. Ringer’s lactate is therefore recommended by our experts as the fluid of choice for resuscitation of the hypovolemic/hyponatremic patient. The management of hypervolemic hyponatremia centers on sodium restriction, water restriction and diuretics. Euvolemic patients with hyponatremia have an appropriate volume status, and so do not require any particular treatment to defend intravascular volume, and management should concentrate on preventing worsening hyponatremia. Once you have correctly identified and managed the baseline volume status of the patient through either volume resuscitation or diuresis, the goal becomes preventing further exacerbation of the hyponatremia. This is achieved through strict fluid restriction and saline locking the IV. It is extremely important to communicate this to the patient family and healthcare team. Water can literally kill your patient with hyponatremia! The situation in which our experts recommend administering IV DDAVP 1 microgram in the ED to prevent osmotic demyelination syndrome is in the hypovolemic patient with hyponatremia who has been given IV chrystalloid for volume replacement and now has a high urine output >100cc/hr and urine osmolarity <100mosm/L. The rule of 6s can be helpful in guiding your correction of hyponatremia. “Six in six hours for severe symptoms and then stop” implies that if you need to rapidly increase serum sodium due to a neurologic emergency do not correct more than 6mmol. “Six a day make sense for safety” implies that you should not exceed an increase of sodium of more than 6mmol/day. While different sources will cite different ranges, targeting six is a conservative approach. If you overshoot by one or two mmol then you will still be well within the safe range. Cerebral edema should be considered in all patients with either severe hyponatremia or a rapid lowering of serum sodium concentration and altered level of consciousness. Measurement of the optic nerve diameter with point-of-care ultrasound (POCUS), and a CT scan of the head may show effacement of the sulci as a surrogate of cerebral edema. If you suspect cerebral edema, administer 3% hypertonic saline as described above. Formerly known as Central Pontine Myelinolysis, ODS is a devastating condition which can occur after rapid over-correction of hyponatremia. It is a clinical diagnosis with a delayed presentation up to 7 days after the rapid correction. The symptoms can vary and are dependent on which anatomical structure in the brain demyelinates. ODS most commonly affects the pons, however other structures can be affected including the cerebellum or basal ganglia. Commonly described symptoms include ataxia, quadriplegia, cranial nerve palsies, and the ‘locked-in’ syndrome. EAH is most commonly seen among endurance athletes. Their hyponatremia is a result of ingesting more free water than they are able to clear by voiding. This leads to an overall excess of free water as the kidneys are not able to excrete it. The cognitive trap is to assume that their symptoms (and electrolyte abnormalities) are a result of dehydration given their exercise history. Don’t assume that dehydration is the cause. The real culprit is an excess of free water. Therefore, the treatment of EHA is fluid restriction! Update 2015: For more on the management of exercise associated hyponatremia check out this position statement. Psychogenic polydipsia is typically seen in psychotic patients who ingest large quantities of free water. Patient’s who are concurrently taking SSRIs (which may cause SIADH) are especially at risk of developing severe hyponatremia. Want to thank you for your podcast. Yesterday, a colleague of mine had a patient with a Na 111. Your podcast was very useful, especially the algorithm, to explain to concept at the bedside. Excellent podcast, thank you ! One question, following the best case ever 33 : at what point do start to worry about over-correcting an hyponatremic patient ? In the case in question, the patient had a sodium “in the low 120″s”, had been drinking and had probably taken ecstasy. Would you have been as worried with a sodium of, say, 128 ? An outstanding review of hyponatremia. Simplified and repeated often allowed the listeners to really grasp the concepts. First time listening to your podcast. I will listen to many more. Hello I’ve just read through your review of rapid correction of hyponatremia and treatment recommendations for most medical emergencies. I am wondering how you would treat a patient who presents to the ER with a known furosemide overdose. An overdose with 5x 80mgs= 400mgs daily for 5 days. My concern in particular is with the cause of hyponatremia being due to a diuretic overdose, and when we discontinue the diuretic, there would be a rapid self correction in a otherwise healthy individual. If the serum sodium has rapidly self corrected back to 135, about 7-8 hours after taking the last dose, and not knowing how low the serum sodium levels had dropped to other than the reported severe physical symptoms during the 5 day overdose, how should one treat this . Would the normal sodium indicate a normal state or a dangerous state of rapid self correction which could potentially lead to a rapid over correction if any fluid is administered. Can DDAVP be administered through any other route ? If yes,the way of administration and the dose. I’m a med student placed at an ED and I’ve just discovered this podcast. Just writing to say how great it is – I really appreciate the written summary too. Thanks for your question. ODS can sometimes be very difficult to predict but can occur in ANY patient with hyponatremia who is corrected too radidly, especially alcoholism, malnutrition, after prolonged diuretic use, prolonged vomiting, burns, chronic psychogenic polydipsia, after liver transplant and hemodialysis patients. The lower the serum sodium, the longer they’ve had the low sodium and the faster it’s corrected, the more likely ODS will occcur. Take home is: go slow! I’m a medical student doing an EM rotation. I was assessing a CHF patient with hyponatremia, and my attending asked what I wanted to do about his electrolytes in the context of fluids (if I recall, Na was somewhere bt. 120-125, no neuro sx); I said we should fluid restrict, the attending said that we should give him NS. This didn’t really make sense to me as although NS has 154 meq of Na, the additional free water is going to make his hyponatermia worse, additionally, this guy has decompensated CHF so why would we give him more fluid? I didn’t say any of that though. More broadly, is it wrong to try and increase serum sodium with NS in a euvolemic or hypervolemic patient? I would guess, yes! Am getting to this response late. I think in a relatively asymptomatic patient, the focus should be on treating the underlying cause of the hyponatremia. In this case, my main goal would be to optimize management of heart failure to improve perfusion and decrease endogenous ADH release. If the patient is severely symptomatic or very hyponatremic (i.e. 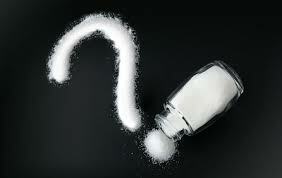 sodium < 120 mEq/L) and edematous, hypertonic saline and furosemide can be given. I agree that I am not sure that there is role for NS in a patient with hypervolemia and hyponatremia due to an underlying disease process that causes reduced perfusion and increased endogenous ADH release (i.e. heart failure, cirrhosis). General principles should be to treat the underlying cause, fluid restrict, and evaluate necessity for medications that could be contributing to hyponatremia. An interesting and intuitive way to think about hyponatremia that I think really complements the content in this post! "The management of hypervolemic hyponatremia centers on sodium restriction, water restriction and diuretics." In the case of heart failure, treating the underlying cause might involve a beta-blocker, ACE inhibitor and mineralocorticoid receptor antagonist, but I'm sure I follow the logic of sodium restriction. Not to mention, in a patient with a chronic illness that will progressively worsen, a sodium restricted diet can really impact the joy in life that is left. this podcast is such a practice changer. I understand the pathophysiology of EAH, but why does an overhydrated/euvolemic man who has just run a marathon have a blood pressure of 98/60 and HR of 96? (you also agree on podcast it is “borderline” and we wonder if we should bolus or not and CTB till the sodium comes back). I completely agree with the management, it’s just unclear why he is tachycardic (for a marathon runner) and borderline hypotensive? Is that common with EAH? I suppose it’s not as important in knowing why these obs are what they are as it is to recognising and correcting a life threatening emergency and prevent it getting worse. Then reassess the patient. It is a cognitive trap that’s for sure! Loved the podcast and ED approach to hyponatraemia, made it simple. Thanks so much for your time!! Regularly listen to your podcasts. I think there is a typo above: Ringers lactate 50mL/hr IV + 40KCl/hr – I think this should be 40 mEq/L. Thanks for the great podcast. Just came across it today and will listen to it again on my (long) way home. I work in a remote rural setting with no access to timely urine osmolality. What should be the trigger for giving DDAVP in that setting? Could we just go by urine output and urine specific gravity? Would measuring urinary sodium beneficial in finding the the causes for Hyponatremia?